One third of employers have to give their staff remedial lessons in basic English and maths, a survey suggests. Managers said staff needed to be able to use correct spelling and grammar and should be competent in simple mental arithmetic without a calculator. One in five employers said non-graduate recruits of all ages struggled with literacy or numeracy, the Confederation of British Industry poll found. The CBI says the UK must "raise its game" if it is to compete economically. The study was commissioned by the Department for Education and Skills as part of its aim to raise basic skills levels through new functional skills modules for GCSEs. A total of 140 companies were questioned as part of the research. Employers in the manufacturing and construction sector reported greater weaknesses in numeracy than in the service industries. Both sectors reported a similar spread of literacy problems. One catering company manager said there was a "total lack of knowledge of times tables" among staff which meant many were unable to carry out basic calculations such as adding VAT or adjusting sale prices. A human resources manager at a building company highlighted problems with foremen who could not calculate how much material was needed for a particular task. "Many don't have the skills to work out the areas of squares and rectangles, let alone other shapes," he told the CBI researchers. A construction firm's personnel manager said: "The standard of literacy shown by people filling in the double-sided application form for a trainee position is often very poor. "Many applicants can't construct a sentence and their grammar, handwriting and spelling are awful." Schools Minister Jim Knight told BBC Radio 4's Today programme that some skills, such as letter writing and mental arithmetic, had "fallen by the wayside". 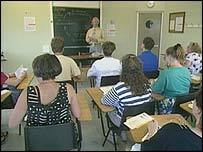 The government introduced extra literacy and numeracy classes for primary school pupils in the late 1990s. Mr Knight said these would improve the performance of the next generation of workers and that GCSEs were being updated to include grammar tests and focus on the basics. Trials will begin in the autumn of new GCSE modules which will examine whether teenagers have mastered the "functional" literacy and numeracy skills needed for work. Mr Knight said: "A good pass in future will mean that young people are equipped with the basics and know how to apply them - that means being able to write and speak fluently, carry out mental arithmetic, give presentations and tally up a till at the end of the day." He told the Today programme: "The GCSE is still a robust qualification. There are certain aspects we want to improve, in terms of employability skills." The CBI called for the percentage marks of these new functional skills modules in GCSE maths and English to be released to employers, as well as the overall exam grades. CBI director-general Richard Lambert said "far too many" school leavers struggled with essential life skills. "The fact that one in three employers ran remedial courses for their staff in the last year is a sad indictment of how the education system has let young people down," he said. Last week, the CBI said UK schools were letting down business by producing too few scientists. Teaching union the NASUWT said the CBI was "never content" with any educational strategy. Its general-secretary Chris Keates said: "The CBI would have everyone believe that there was a golden era in the past when everyone left school highly literate and numerate. "This is simply not the case. For pupils aged 11, 14 and 16, attainment in English and Maths has never been higher." She added: "Rather than constantly carping, the CBI would be more gainfully employed encouraging its members to increase their own investment in life-long learning to the levels achieved by employers in many other European countries."